LWAB Weight Watchers Group -not free $200 payable to WW once we have all participants confirmed. PLEASE NOTE THAT THIS GROUP IS BEING POSTPONED PENDING NUMBERS. WE CURRENTLY HAVE 5 OF THE REQUIRED MIN 15 PEOPLE TO RUN THIS GROUP. PLEASE REGISTER HERE IF YOU ARE INTERESTED IN PARTICIPATING. ONCE WE HAVE ENOUGH PEOPLE, I WILL CONTACT YOU ALL AND WE WILL RUN THE GROUP. FEEL FREE TO SHARE WITH YOUR FRIENDS!!! Private Group for LWAB Moms & Baby! Life With A Baby & Weight Watchers are excited to announce their new Partnership! LWAB Community Development Manger, Connie Berenguer and now certified Weight Watchers Group Leader will be facilitating LWAB Exclusive WW Baby-Friendly Groups across LWAB Chapters in 2018. If you are interested in a WW group in your chapter area or business, please contact connie@lifewithababy.com for more information. We need 15 people to run a group in a chapter area or business! 16 weeks total starting the week of Jan 8th (goes until May 21st) **perfect timing for getting back on track after the busy holiday season and in great shape for Summer 2018!! Cost is approx $250 for the entire program including the weekly meetings, weight in's, app access, educational materials etc. costing to be confirmed closer to the start date as there are promos closer to then. cost quoted is the approx. / greatest cost for the program. may be cheaper closer to the date pending promos!! **note that this program does not require the purchase of ANY special branded food, meal plans or gadgets. You can eat all your own foods that you shop for. Payment can be made in installments. You do not pay LWAB for the program. Your pay WW direct once we have all our participants signed up. Meetings will be approx. 60 mins long. We begin each meeting with our weigh-in's and mingling and then we get to the "feature presentation" / education component for the week. We send you off with weekly resources and reading material. IF YOU ARE ALREADY ON WEIGHT WATCHERS, YOU CAN STILL JOIN / TRANSFER TO OUR GROUP!!! PLEASE CONTACT ME REGARDING THIS. 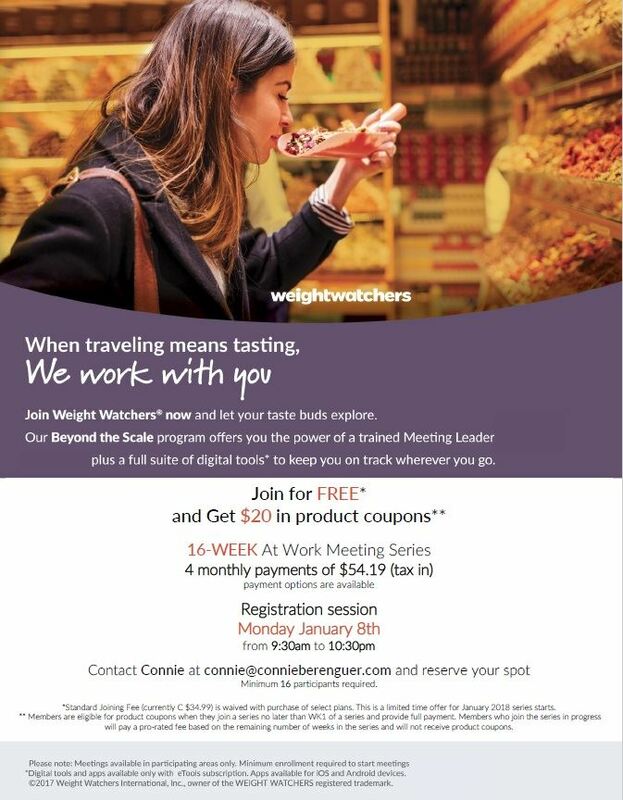 If you have any questions about the program, please visit www.weightwatchers.ca. NOTE THAT WE WE NEED 15 PEOPLE MIN TO RUN THIS GROUP!!! PLEASE REGISTER ONLY IF YOU ARE SERIOUS ABOUT PARTICIPATING. PLEASE DO NOT REGISTER AND BAIL ON US. Thank you for our amazing space sponsor, The Play Lounge for hosting us weekly!!! Please note that the play area is not available free of charge for children to play in before / after / during the WW meeting. Also children must be minded by parents AT ALL TIMES. If you would like to stay and play after the meeting, there is an Exclusive rate for LWAB members!!! PLEASE NOTE THE PLAY LOUNGE HAS A STRICT NO OUTDOOR FOOD POLICY AND NO NUTS. FOOD, DRINKS AND SNACKS ARE AVAILABLE FOR PURCHASE. *registration day only. does not count towards program weeks!